Bangus becomes more special when you marinate it in Knorr Liquid Seasoning. With carrots, potatoes and peppers, there’s an added treat! 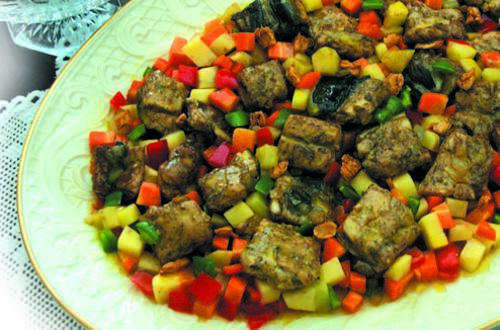 1 Let’s begin by marinating the sliced bangus cubes in Knorr Liquid Seasoning and ground pepper for 30 minutes. 2 Now get a pan and make it nice and hot over medium heat. Melt some margarine and throw in the garlic then sauté until golden brown. Throw in the onions next and cook until translucent. Gently add the bangus including the marinade but do not mix. Just cover and simmer for 1 minute before adding the carrots and potato. Reduce the heat and simmer for 20 more minutes. 3 Mix in the red and green bell peppers and simmer continuously for 8-10 minutes or until the bangus is cooked and that’s our dish! All you need is the whole family to enjoy a serving of Bangus Espesyal because something as nutritious and good as this is best shared with your loved ones. What are you waiting for? Taste and be delighted!